It’s the first month of the year and time to put our authors on the hot seat and grill ’em, audiobook-style! 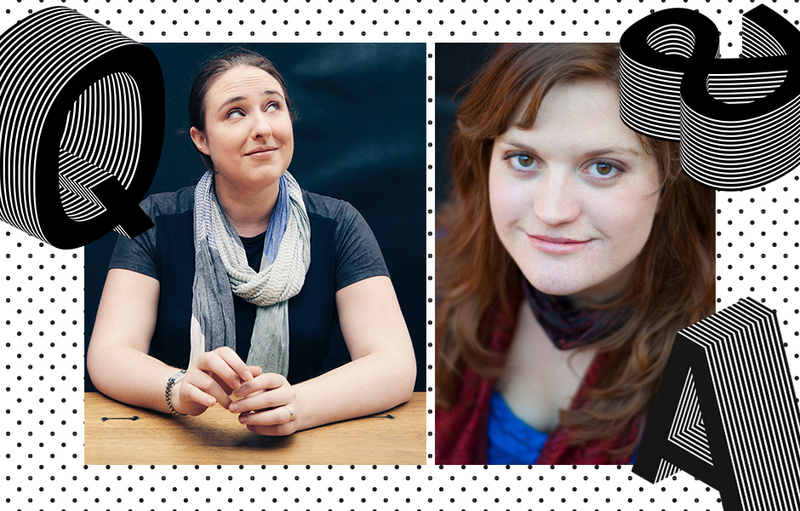 We asked Amie Kaufman and Meagan Spooner, co-authors of the YA SciFi series Unearthed, about first collaborations, first audiobooks, and their newest release, Undying. What was the first book you remember reading? Amie: For me, it was the classic Are You My Mother? by P.D. Eastman. I had the whole thing memorized long before I ever read the words! The first time I recited it to my actual mother, she thought for a moment I’d spontaneously learned to read! Meagan: The first book I remember reading was Where the Wild Things Are, by Maurice Sendak. I was obsessed with it, to the point that I read every word in the book, including the copyright notice in the front. I asked my mom what it was, and she told me it related to the author. And that was the moment I realized someone wrote the books I read…and that I could do that too. What was the first audiobook you ever listened to? Amie: It was Mrs. Frisby and the Rats of NIMH, read by Gwen Watford. I can still hear her voice in my head every time I read the book—I must have listened to it a hundred times—and I’d give my kingdom for a copy of that recording! Meagan: The first book I remember listening to was The Hobbit—I loved that it let me close my eyes and really imagine the world I was visiting. I still sneak back to Middle Earth sometimes. Amie: My first book was a middle grade novel I still love to pieces, but that I’ve never tried to publish. I hope one day I’ll go back and do something with it! My second was These Broken Stars, which Meg and I wrote together, and which was our first published joint work! Meagan: The first book I wrote was Skylark, which was also my first published book. I’d just finished the amazing Odyssey Writing Workshop, but I found myself paralyzed by all the lessons I’d learned there. Where to begin? Then one day the beginning of Skylark showed up, and the story just began to flow. Who was your first collaborator? Amie: Meg was my first collaborator! We originally met in the fanfiction and online roleplaying community, where we wrote all kinds of things set in other people’s worlds, and became friends through that. Meagan: Then one day we decided to try our hand at something original, just for fun! We had no idea that story would turn out to be These Broken Stars, and that we’d end up publishing it together! And now we’re wrapping up our second series together, with Undying! What’s the first thing you did when you finished writing your book? Amie: We try to get together to write at least once a year—I live in Australia and Meg’s in the US—and if we finish a book together then we take ourselves out for a fancy high tea, and remind ourselves what it’s like to be humans, instead of pajama-clad writers on deadline. Meagan: And to be honest, if we’re not together, we pretty much stay pajama-clad writers, but we probably order some very fancy take-out to be delivered to our doors! What’s the first thing you will listen to/listened to in 2019? Amie: I have an audiobook library of over 300 titles, so it’s a liiiiittle bit of an addiction. I recently listened to The Thief by Megan Whalen Turner, read by the amazing Steve West, and I think in 2019 I’ll start by jumping into the sequel, The Queen of Attolia. Meagan: I’m currently “re-reading” my favorite audio series, the Amelia Peabody mysteries by Elizabeth Peters. The narrator, Barbara Rosenblat, brings the book to life in a way that pulls me in every time. Amie’s a big fan too—we even named Amelia Radcliffe, the heroine of Unearthed and Undying, after characters from this series! I think by the start of 2019, I’ll be up to book twelve, He Shall Thunder in the Sky. Mia and Jules are trapped aboard the Undying’s ancient spaceship and desperate to warn earth of the dangers ahead. But after surviving the crash-landing home, no one believes them—and they are forced to take matters into their own hands. From the mountains of Spain to the streets of Prague, this audiobook is a white-knuckle ride that will keep listeners guessing until the final moments.